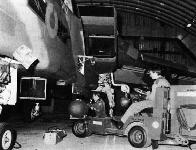 Tornadoes from No 9 Squadron at RAF Honington and No 27 Squadron at RAF Marham rehearsing the first "diamond 9" formation flown by these aircraft, for the occasion of HM The Queen's Birthday fly-past on 16 June this year. 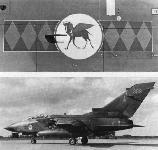 Aircraft in the markings of the AMI (extreme right), the Luftwaffe and the RAF on the flight line at RAF Cottesmore, the home of the Trinational Tornado Training Establishment (TTTE), which was the first Service unit to put the Tornado into operation. 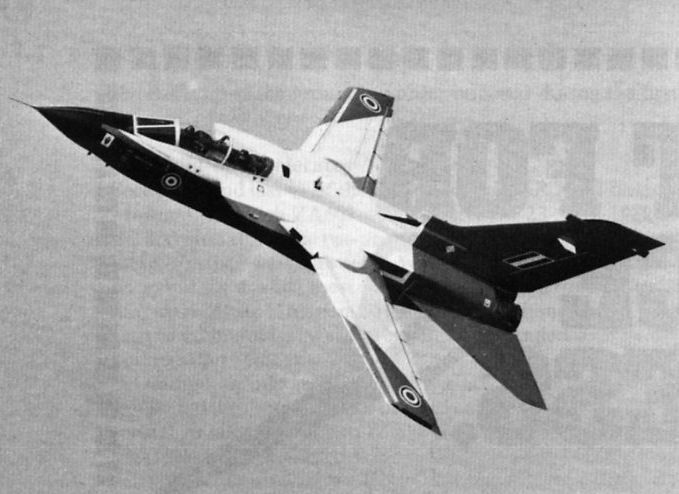 The only British Tornado in other than standard RAF camouflage at present is ZA326, which is used by the Flight Systems Department at RAE Bedford for a variety of trials tasks. 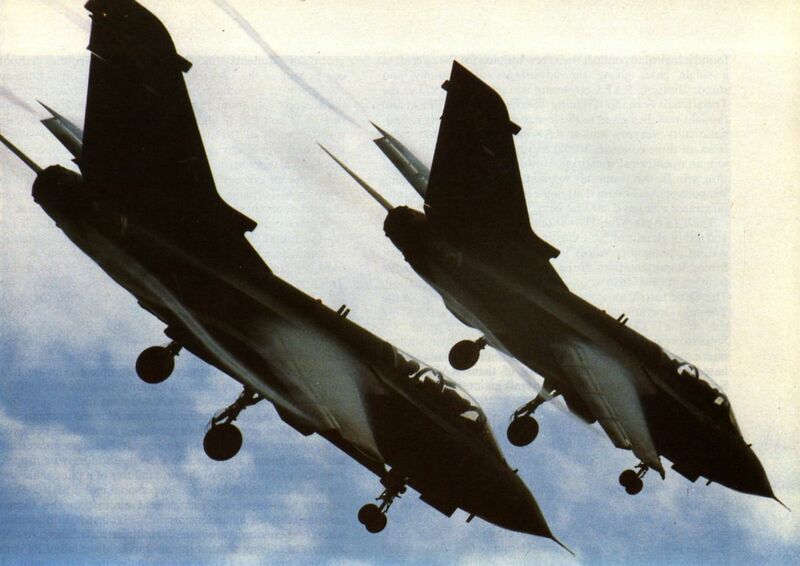 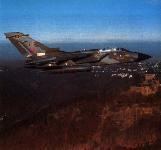 Trials of the important JP 233 pod under way on the Tornado ZA354. 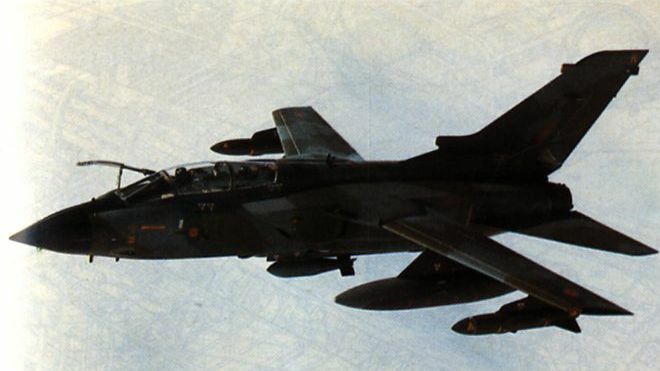 Each of the two JP 233s carried by Tornado contains 215 area-denial mines and 30 parachute-retarded runway-cratering submunitions. 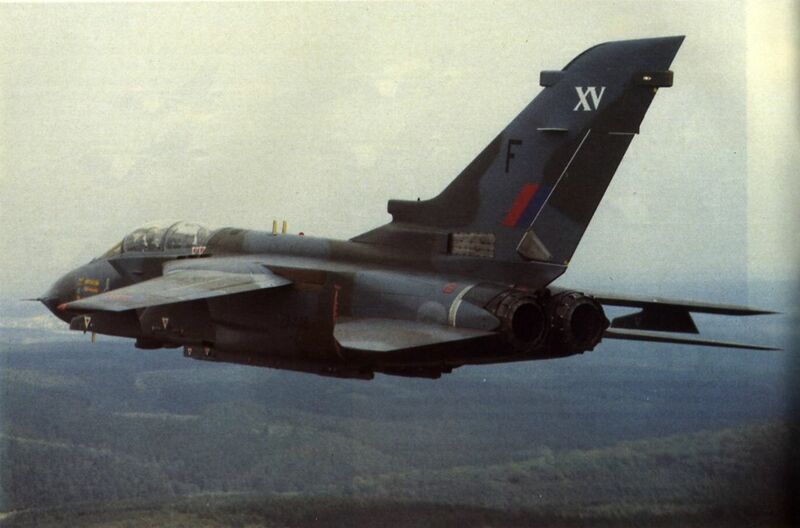 A Tornado of No 617 Squadron carrying the Philips BOZ-107 chaff/flare dispensing pod on the outer starboard pylon - matched to port by the Marconi ARI 23246/1 Sky Shadow pod. 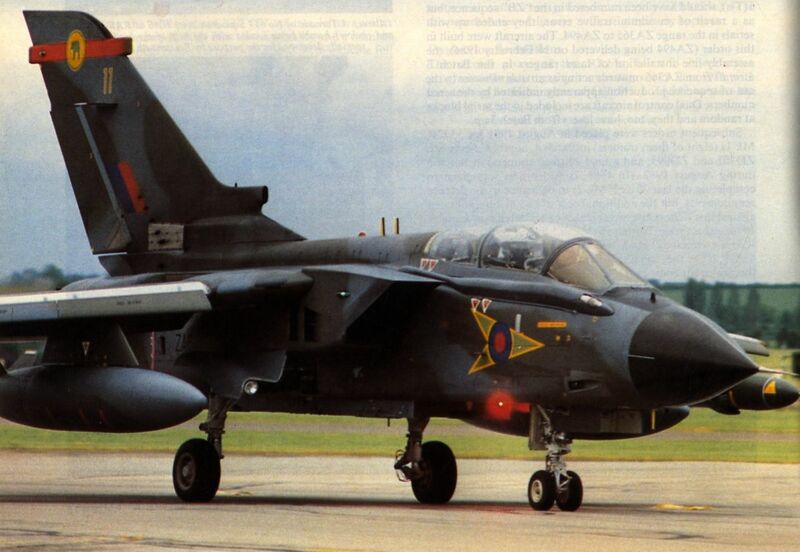 Tornado ZA376, one of the four aircraft assigned to the Tornado Operational Evaluation Unit. 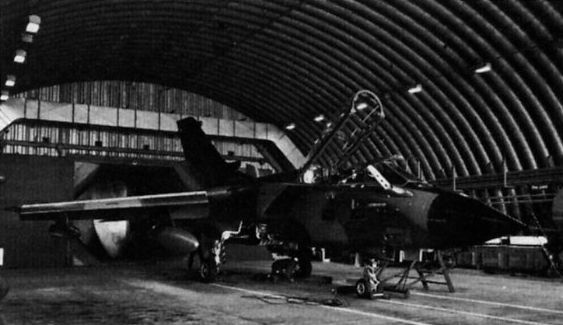 One of the Tornado GR Mk Is in service with the TWCU at RAF Honington. 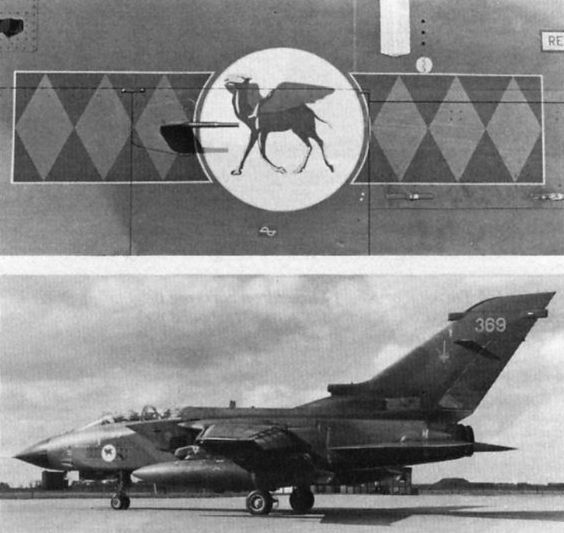 and a close-up of the badge of No 45 Squadron adopted by this unit. 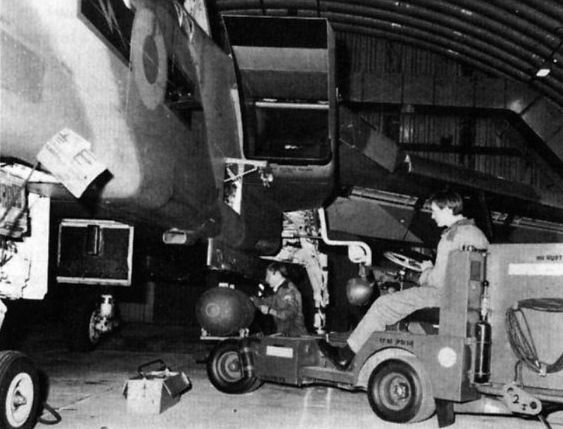 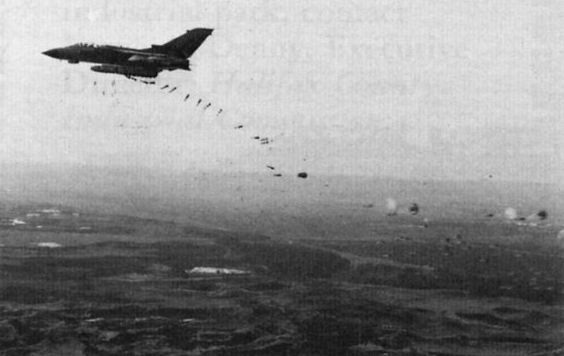 Bombs being loaded with the help of the loading trolley specially developed for the purpose by Portsmouth Aviation. 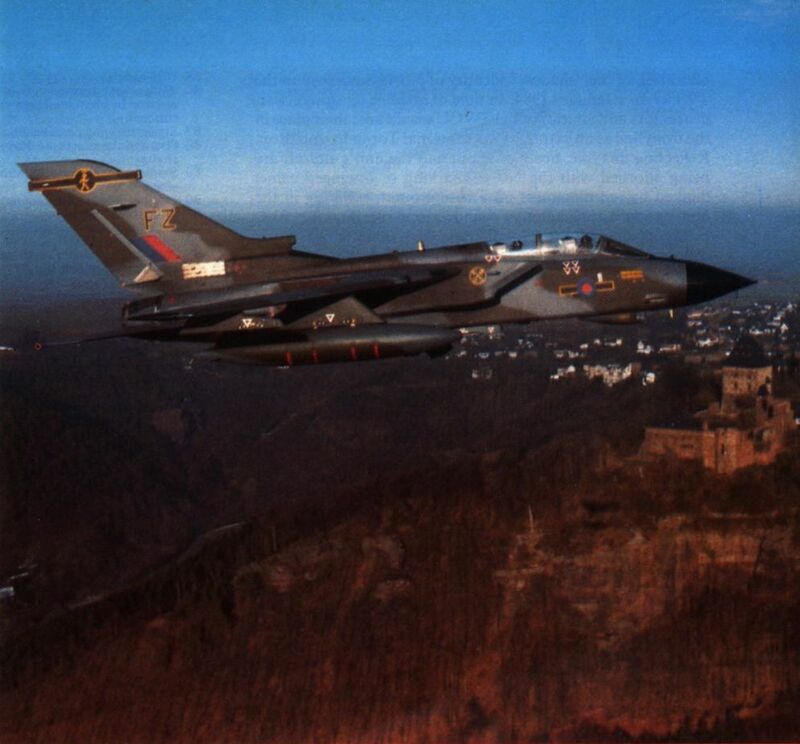 Matching the sophistication of the Tornado is a computerised flight planning facility installed in each squadron HQ. 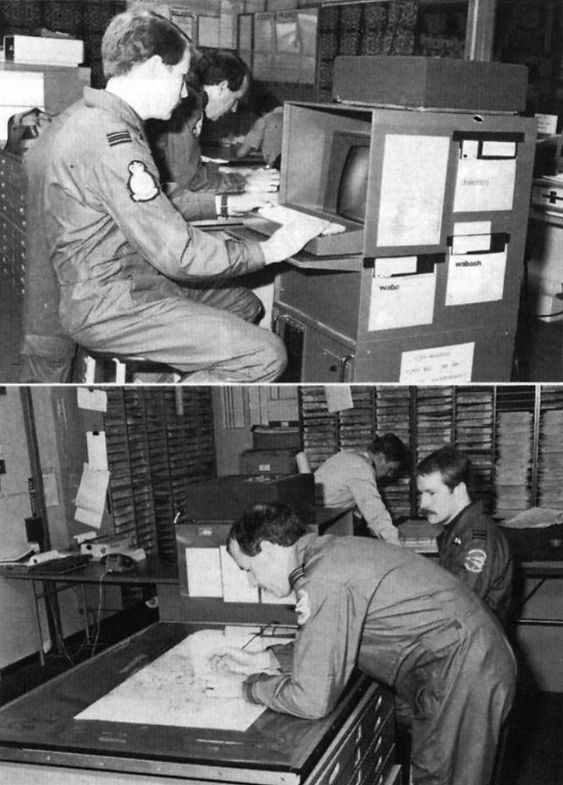 Navigators plot their intended route by hand-moving a cursor over the small map table, “punching-in” way-points. 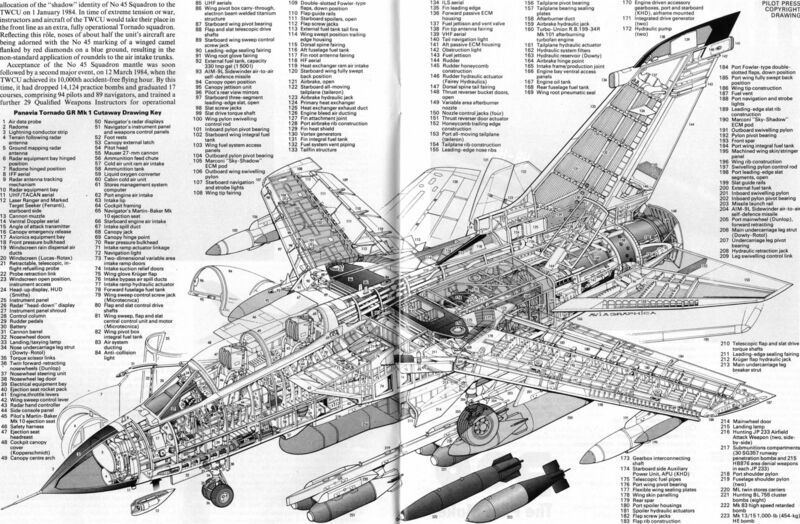 The flight plan, recorded on a small tape cassette, is then inserted into the aircraft to be flown unerringly by the autopilot.